Flowbird rewards the Sauv Life application at CES in Las Vegas. From January 8 to 11, 2019, Flowbird was present at the CES (Consumer Electrics Show) in Las Vegas, the show for excellence and innovation. 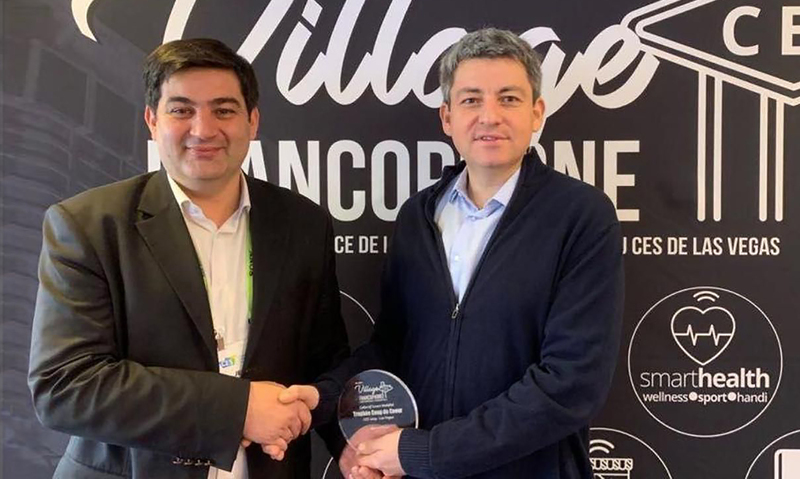 Coordinator of the Smart Mobility collective in the French-speaking Village, Jérôme Stefanello, Urban Services Director, went in search of new innovations with other mobility actors. The favorite of the Smart Mobility collective. Accompanied by members of the collective (Transdev, Enedis, Colas, La Tribune, Citelum, Bouygues, IVEO, Via ID, Acome, Mobivia, Bombardier Transport, SNCF..), …), Jérôme Stefanello received twelve startups proposing more innovative solutions to mobility issues. But the jury, chaired by Luc Chatel (President of Autonomous Vehicles) insisted on awarding a special prize to the Sauv Life application, designed to save the lives of victims of cardiac arrest. Bertrand Barthélemy, President of Flowbird, awarded the Coup de Coeur Trophy to Lionel Lamhaut, emergency doctor at the Samu de Paris and creator of the application. Phantomintelligence enables afdortable Smart Mobility, which wins the trophy for the best start-up! The award was presented by Mrs. Brandy Stanley, Flowbird customer and Parking Services Manager of the City of Las Vegas. Mobeelity, a mobility aggregator dedicated to companies, took second place. And the 3rd prize went to Rox, a micro-donation solution for transport. Congratulations to all the participants for their creativity!